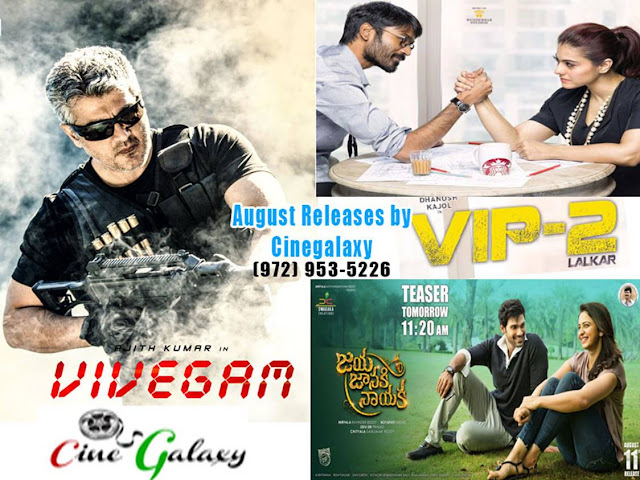 It’s going to be quite a phenomenal August for the leading distributor of India cinema overseas, CineGalaxy Inc. With three highly anticipated films set to release in August month, under their banner in the North American arena, things are really looking up for them. While Tamil film VIVEGAM (Vivekam in Telugu) starring Thala Ajith, Kajal Aggarwal and Akshara Haasan is one of them, their Telugu release is the mass director Boyapati Srinu’s Jaya Janaki Nayaka starring the hot favourite of the season, Rakul Preet Singh alongside the young happening actor Bellamkonda Srinivas and the diva Pragya Jaiswal. And the third film they are set to release is VIP 2 which is set to have a multilingual release in Tamil, Telugu and Hindi. With so much happening on their end, the team is very elated, especially since they are associating with very prestigious names and banners. CineGalaxy has always aimed to bring the best of Indian cinema to the audience overseas. After associating with several hit films in the past, the team is hopeful of recreating magic at the box office once again. The team will leave no stone unturned to ensure that each of these films gets a very huge release, and in that regard are also going to go all out to promote the film. Keep watching this space for more updates on the release dates and other updates of the films!